Originally posted in The Independent Voice. “Vultures Above, Lions Below” is the Nietzsche quote “what doesn’t kill you makes you stronger” in album format. BURIED IN VERONA have been around since 2007 and had more line-up changes than active years, but it seems that the last one, early this year, shook them up badly. They felt betrayed. And whether that feeling was a fount of inspiration or not – lyrically, they’ve always approached this kind of issue – the truth is that their sound is more mature now. 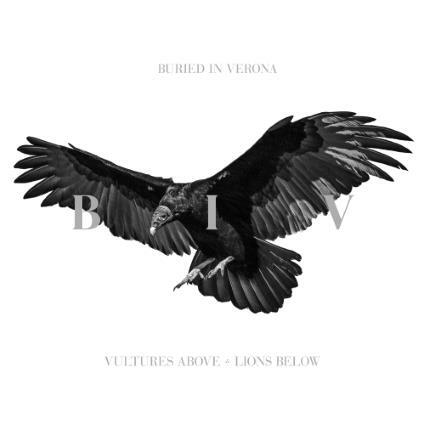 Having previously shown the intention of heading towards a more melodic direction, “Vultures Above, Lions Below” manages to do so in a classy way, while keeping the brisk sharpness that earns them the metalcore label. More mainstream? Maybe – they even produced two power ballads, “Hurricane” and “Can’t Be Unsaid”, the first one with a killer guitar solo. But I honestly believe this is just the natural next step in the band’s musical growth, hence the “mature” term. These twelve tracks feature enthralling keyboards – especially on “Vultures Above” and “Reflection”; on “Lions Below” too, even if they somewhat resemble FAITH NO MORE’s “From Out Of Nowhere” – mixed with throbbing, straight-forward riffs – “Extraction”, “Pathways”, “Done For Good”, “Unbroken”… –, all with catchy choruses and juicy gang vocals. Speaking of vocals, the fact that Brett Anderson doesn’t growl but sings in an angry and raspy voice instead, combined with guitarist Richie Newman’s clean tone, that’s quite a nice treat. The band claims this is their best and most honest effort so far. If you’re into melodic metalcore, you’ll probably agree. I do. This entry was posted in CD reviews and tagged BIV, Buried In Verona, melodic metalcore, metalcore, UNFD, Vultures Above. Bookmark the permalink.